I'm not going to beat around the bush. This thing looks like a severed testicle. Always found in Darkwater Clams. If you have some AOE-skills these are easily grinded in Sholazar Basin, 31 - 75 (west of mosslight pillar). As boomkin I just used Starfall and Hurricane every other 3-minutes and got myself quite a few clams. These things go for around 4.5g a pop on some servers. Epic Farming. They're still bugged ever since beta and are incapable of automatically stacking so if you loot 10 clams you will have have ten of these all laying 1-per-stack in your bag, taking up one bag slot per clam meat. I wonder if blizzard is even aware of this stacking bug. So if you have a stack of 19 already, and no room left in bags, you'll actually be unable to loot a clam because it will try to place the clam meat on a new stack instead of stacking them with your existing meat. You have to manually take them one by one and stack them (or get the addon called BankStack, which can sort/compress/stack the inventory or bank, and just type /compress to finish all stacks). - Clam, meet Balls. Clam, Balls. These are easily found in which are fished in the ocean waters. I catch them 1 in 10 catches. I farm these off the Winterfin Murlocs at 40,17 in Borean Tundra. The drop rate isn't great, but they also drop Winterfin Clams which can be used to purchase items from the Winterfin vendor. If you are gaining reputation with the Frenzyheart Tribe there is a daily quest to pick up called "Secret Strength of The Frenzyheart". You are to make a special alcholic brew that will give you an immense damage buff. This brew is not consumed on use and lasts 10 minutes. So you can continue to apply it every 10 minutes. With this buff ony my mage, every single offensive attack I made was given a 2-2.5k damage increase, even my melee. If you mount up and run around the area gaining aggro and use a simple AOE, they will take 2-2.5k damage extra every TICK! Does not matter the spell. I spent an hour here and easily made 200+ of these clams and about 15-20 Northsea Pearls. The respawn rate seems to be about 30seconds to 1 minute after they are killed. The area is pretty large so you will basically never run out of gorlocs to kill with the respawn rate. EDIT: Sorry I just noticed a few posts up someone mentioned this area. However they didn't mention using this daily quest to increase your damage so I'm just going to leave it for whoever will find it useful. Clam meat's finally gonna stack right in 3.1! 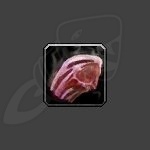 From the 3.1 patch notes: 'Changed the icon for Succulent Clam Meat so it doesn't look quite as disgusting'. Sad, a pair of these would have gone well with the original Serpent Flesh. -- A new clam, the Giant Darkwater Clam, can be obtained by fishing in Wintergrasp. This might clam has a greatly increased change to drop pearls, and yields up to five times the regular amount of clam meat. -- Loot from clams now stacks correctly! -- Changed the icon for Succulent Clam Meat so it doesn't look quite as disgusting. Now 100% more succulent. So, where can these be found? I opened a ton of Darkwater clams, and they were completely empty (except 2, which contained Siren's Tear). The Brooding Darkwater Clams which (wowhead claims) contain Succulent Clam Meat have an extremely low drop rate as well. Wow, I hadn't seen the original graphic until now. I'm really glad I didn't run into these until after they changed the pic, that would have given me nightmares. got alot fast with the winterfin shorestrikers in borean tundra and it was in the Darkwater Clams. I was going for Second That Emotion and Bad Clams was the last item I needed. I looked up here on WoWHead where to get the mats since none of the items were readily available on the AH. I found that the only item dropping Succulent Clam Meat was a clam with an exceptionally low drop rate for it's value. Then I decided to go and farm it. Turns out Darkwater Clam drops it as well! Just a note to people who need this item. If you happen to be in the Howling Fjord farming Shoveltusk Flanks, and need some Succulent Clam Meat as well, there are murlocs (18, 20) on the coast just west of the Apothecary Camp that drop Darkwater Clams that contain Succulent Clam Meat. The drop rate isn't the highest, but the respawn rate of murlocs is high and if you're lazy to fly somewhere else, it is a viable option to grab a few for the cooking achivements.